Not sure when my blogging time will start to dwindle so I thought I'd share some pictures with you today, those taken for an article I recently wrote for Green Bay's YOU Magazine which hits our news stands sometime next week. 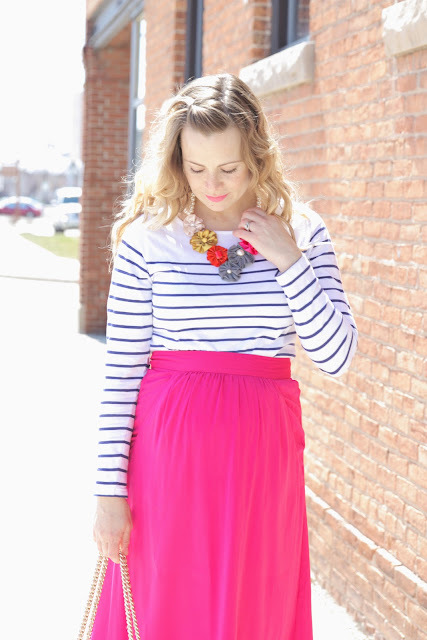 I worked with a gorgeous boutique in downtown De Pere called Azure (one of my local faves!) 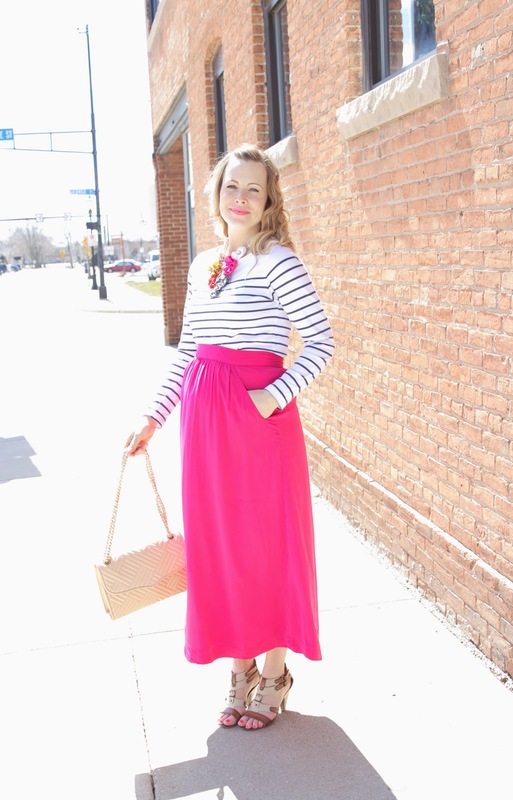 and styled some of my own clothing along with theirs in the hopes of encouraging preggie moms to enjoy the hottest spring trends despite their growing curves and to consider the options non-maternity stores have to offer us. It's just so great to find pieces that can remain in our closets even after that baby has made its blessed arrival and thankfully, maternity fashion is not what is used to be! Even compared to my first go round with all of this 9 years ago ... it's come a long, lovely way. And sure, we're not all going to carry our babes the same way but there are great ways to flatter your bump (plus the other additional bumps) to the fullest, tips that can work for everyone. You can pick up a copy of our fashion issue next week to read the article in its entirety but in the meantime, here's a quick breakdown of the clothing I wore. Pairing an oversized or relaxed top with fitted bottoms (or vice versa) is most flattering. Skinny jeans or leggings with an oversized shirt or tunic (make sure you wear a longer shirt or tunic that covers your bum if you're wearing leggings!) or a fitted t-shirt (to show off that cute belly) with maxi skirt or wide, relaxed pants. It's about proportions and balancing them out. All loose or all tight is not as complimentary to the figure. Bring the waistline up, up, up and accentuate it with a little belt, a shrug, or a cropped jacket. Belly's are so stinking cute, so show it off! This trick will also lengthen your legs, always a lovely advantage.